Petro tympanic is a soft tissue present in ear which connects to regions together i.e. middle ear and temporomandibular joint. These soft tissue may transfer forces from middle ear to temporomandibular joint. In this condition a fissure occurs at the petro tympanic soft tissue of temporal bone. Its front part is attached to articular tubercle and the inner part attached to tympanic part of temporal bone. It appears to be open above or facing the bony ring of ear. It is responsible for the separation of mandibular fossa into articular tubercle (anteriorly) and tympanic part (posteriorly). Through fissure, the chorda tympani i.e. nerve 7 runs towards infratemporal fossa. The other names of this soft tissue are fissure petrosquameuse, fissure petrasquamosa and glaserian fissure. It appears as a small slit which is 2mm in length. There are many functions associated with this soft tissue. It helps in communication of middle ear with an inner temporomandibular joint also It helps the tongue with a special sensory innervation via lingual nerve and transports chorda tympani and anterior malleus ligament along with anterior maxillary artery associated tympanic branch. Cranial nerves branches are present in it mainly nerve 7 (chorda tympani) and 9. Chorda tympani is a part of nerve located at face. This nerve originates from tongue passes through the middle ear and reaches to the brain. This nerve carry messages regarding taste. This nerve joins the cranial nerve of face i.e. nerve 7 in the facial canal at the point of exiting facial nerve from skull through petro tympanic fissure. There are three cranial nerves associated with taste and chorda tympani is a part of one of these. The sense of taste have a complicated feedback system as the other nerves try to inhibit the other nerve signals. Chorda tympani have high power of inhibiting other nerve signals including pain associated fibers. Chorda tympani have 2 main nerve fibers functioning. One of them is sensory fiber associated with taste and 2nd one is presynaptic fibers having parasympathetic effect. The branching of chorda tympani can occur at proximal, distal or mid part of facial nerve. Then it run towards neck of malleus. The tympanic segment of chorda tympani is the part which crosses the middle ear connecting it to incus. And then this rejoins on the other end of middle ear and at the end it exit the petro tympanic fissure. Petro squamous fissure is different from petro tympanic fissure as it is present at a specific part of ear i.e. between medial petrous which is horizontal and lateral oriented squamous which is vertical part of the temporal bone in ear. 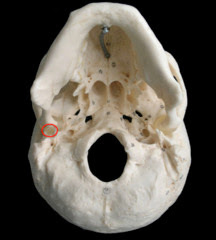 Basically petro squamous fissure shows the line of joining of petrous and squamous part of temporal bone. The petro squamous fissure further continue the petro tympanic fissure in the temporal bone of ear. These two collectively may known as the squamotympanic fissure. The Petro squamous fissure is also called a shallow fissure.